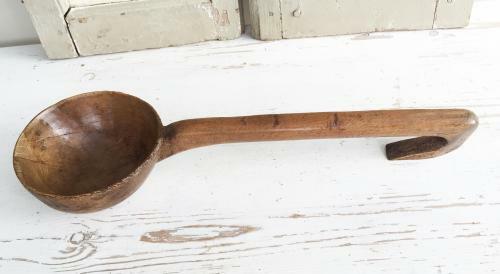 This is a fine 19th Cent Country Cooking or Dairy Ladle (possible in Fruitwood) with large bowl and hooked handle. Typical of the type used with Dairy Bowls in Wales. The ladle has had an old repair on the bowl where someone has added a replacement piece of wood to a missing chip hence price. Very hansome piece of treen.